You would think its easy enough to cut some nails on a tiny person, and when it comes to a sleeping baby, of course it is. However, when you are faced with a lively Toddler, its a whole different story! Personally, most often than not, the possible outcomes of cutting my toddler’s nails usually result in one of the following: All nails cut except for the five on his right foot, or if I’m lucky, all nails cut except for ONE – the big toe on his left foot. 1) Take a break between cutting each nail or at most five. I don’t mean a half an hour break, but just enough to give them some time to wriggle their hands and feet about, because we all know toddlers can never sit still for more than 0.5 seconds. 2) Talk to them or ask them questions. Asking my toddler about his toys or where he would like to go in the weekend manages to give me just enough time to cut a finger nail whilst he mulls over the answer in his head and begins to talk. 3) Spread out a few books for them to read, or look at the pretty pictures. “Oh look, the cat is trying to climb the wall!” *Snip*. 4) Let them watch Baby TV or nursery rhymes on the iPad. The “Digital Nanny” (as Mother Pukka calls it) works every time. Your little one will be far too engrossed in singing along to “Old McDonald” to notice you even exist. 5) Give them the reigns. Let them bring you the nail cutter (provided it is safe to do so!) or let them choose which nail cutter they would like their nails to be cut with. Putting them in charge will get them rather excited about the entire thing and perhaps they will be willing enough to sit down and let you cut their nails. 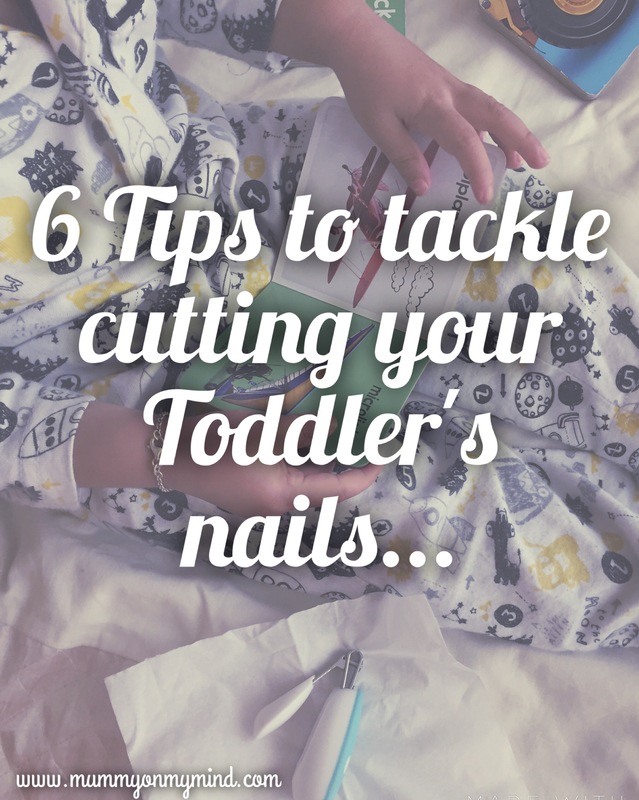 6) Let your toddler collect the cut nails. This one might be a little too irksome, but once I cut my toddler’s nails, I give it to him to put in the tissue, for me to bin away once all of them are done. This gives him a sense of responsibility and anticipation of the next cut nail so he can dispose of it. Bonus Tip: Don’t cut their nails too deep. I have made the humongous mistake of cutting one of my toddler’s finger nails a little too deep. Let’s just say I wasn’t allowed anywhere near that hand for a good few weeks. In my defence, he was wriggling!!! Let me know if you try out any of the above, and I really do hope it works for you! Be sure to mix up the tricks and tips so the toddlers in question do not grow bored of your battle techniques. Happy Nail Cutting…until two days later when they have somehow already grown back to full length! URGH! Feel free to share your thoughts on this riveting subject in the comments section below! I would highly appreciate more tips on the matter, and so would every other mother reading this! Thank you! This is seriously one of the hardest tasks to do! When nothing else worked, I did it when he was asleep. Haha it really is the most challenging of parenting tasks!! So close to my heart. An activity I still struggle with, but will follow your tips to make life easier. Haha I hope so! Please do share if you have any tips of your own! We cut ( pretend cutting ) his favorite animal toys’ nails, he gets excited and offers his nails to cut too. Such a great idea! Will definitely try this next time with Baby Z!